I was lucky enough to win 3 Barry M Stain Paints* on Twitter a couple of weeks ago and I have been wearing all 3 shades so much. I have tried Barry M nail polishes, blushers and eyeshadows but never their lip products. I’m really impressed by these new Stain Paints and really hope they add a few more shades to the line, because at the moment there are only 3 colours. The first thing that stands out is the shiny silver and black packaging, it really catches your eye. It’s a little different to the typical lipstick packaging and I really like it. All three shades are really nice to apply, they glided on with ease and felt quite creamy on my lips. I wouldn’t say they dried to a matte finish as they have a slight shine to them. The formula didn’t feel drying at all and all three shades are very bold. So if you like to wear more subtle lip colours these won’t be for you or you might want to blot the colour so it’s not so intense. 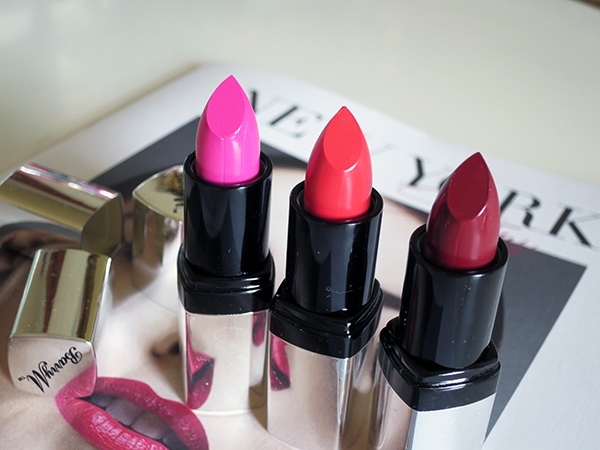 These offer you the pigment of a lipstick with the staying power of a lip stain. BarryM have done very well with these, I like all the colours but if I had to pick one favourite it would be Eternal Coral – for me this is the easiest colour to wear. All three shades are very bold so these have been pushing me to be more adventurous with my lip colour. They pack a punch & I was surprised how little the colour dulled throughout the day. Even after eating and drinking the product was still bold on my lips and the colour wasn’t patchy or uneven. I would say these lasted a good 3 hours but after that they needed a touch up which on me is great as lip colours tend to fade & rub off so easily on my lips. These Stain Paints are purse friendly but don’t compromise on quality. If you have a BarryM stand near you go and swatch these, they’re all beautiful.